Thanks to Andy for these samples. I drained these ages ago but I’ve finally typed up my tasting notes…! 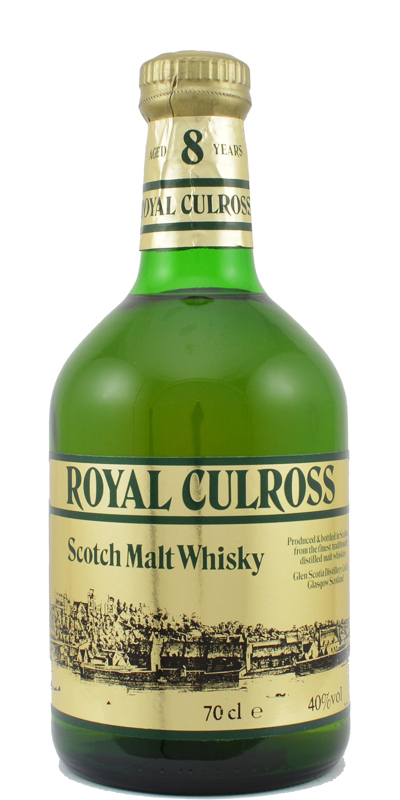 These are always fun – a blended whisky from the 1960s. You can find bottles like this on a lot of auction sites and they tend to sell for a lot less than you might imagine, taking a backseat to all the high flying single malts. Nose: Malty caramel, candle wax, menthol, and pears. A gentle floral edge develops after a while. Palate: Syrupy! Very rich and rounded malty flavour with more menthol and a little pepper mint. Finish: Quite short with black pepper. This, as with many blends, is all about the core malt flavour. It’s soft and sweet, like nectar with no hard edges or dominating notes. Very drinkable and smooth, much moreso than modern low-end blends where the malt content has dropped dramatically since the 1960s. Nose: Orchard smells of ripe apples and pears, with desserty notes of custard. There’s a dessert-wine character to the aroma too – sweet juicy grapes. Palate: Very appley. Tart and crisp cider, with cinnamon spice and ripe barley grain. Reminiscent of Irish whiskey, with a gristy, unmalted barley note. Finish: Toasted nuts and warm oak with a lingering apple edge and a touch of pepper spice. I wonder if there’s any Macallan in this… Very nice malt, and quite three dimensional for a blend. Good old Whiskybroker. You can get some very nice whiskies (by the cask, as well as by the bottle) at very reasonable prices indeed. 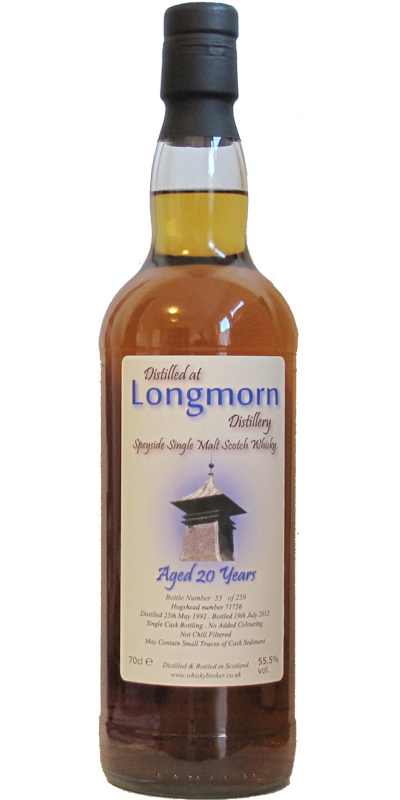 This one’s a sherried Longmorn. Nose: Orange candy, pine resin, pencils, barley mash, freshly ground hazelnuts and a pinch of ginger. Palate: Crystalised white grape sugar, malty bread, and toasted oak with rising nutmeg and anise spices. Becomes drying and fruitier with water – a plummy note comes through. Great nose on this, and the palate gets better with water. At 55% ABV it’s a little too fierce but maybe watered down to 45%-50% and it’s perfect. I love an indy bottling of Springbank! MoM’s single cask bottlings usually sell out quickly and have a good reputation for quality cask choice. Nose: Sticking plasters, cough syrup, and leather with smoked caramel and pebble beach. Palate: Oily, sweet, and salty with rich malt and cinder toffee. Cinnamon in custard, with a slow-rising, lip-tingling chilli oil burn. Finish: Oak and smoke, with hazelnuts. 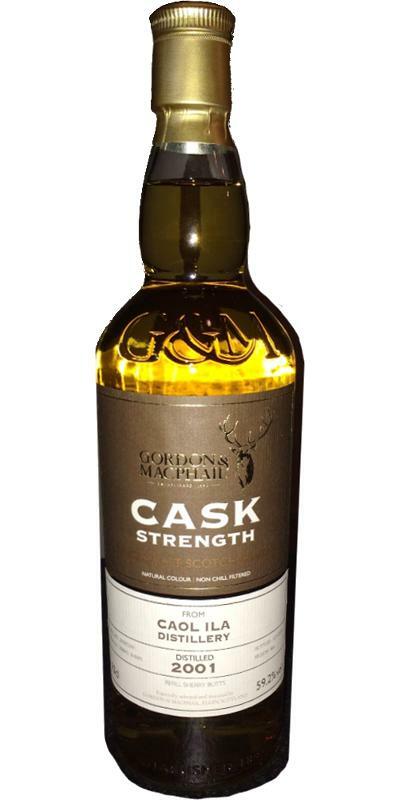 Balls to salted caramel latté – if you want an oily, malty, coastal zing then this is the whisky for you. My word, do they know how to do whisky at Springbank. Another cask well chosen, chaps! Gordon & Macphail have a ridiculously large catalog of whiskies. One of Scotland’s oldest independent bottlers, they’re still owned and managed by the Urquhart Family. Well worth a look at their offerings, and the prices are usually very reasonable. Nose: Beach bonfire, salty clifftops, sawdust, motor oil, buttery kippers. Palate: Coal dust, cough drops, with custard creams and sweet milky fudge. Yummy – great coastal peat notes here. No citrus, which is unusual for Caol Ila. Tasting blind I think I’d have pegged this as an Ardbeg – that coal dust flavour’s really full-on, like you’ve actually licked a coal scuttle. All done! Thanks again, Andy – some cracking drams there.